We understand how annoying that can be, and we know the importance of effectively communicating and collaborating when working in a team. 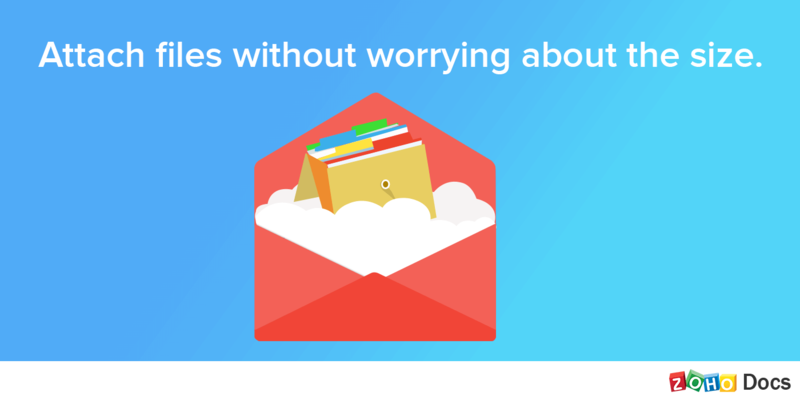 That’s why Zoho Docs and Zoho Mail are coming together to bring you a clean interface for easily attaching large files. When you save your files in Zoho Docs, you’ll be able to add videos, images, audio, or any other file type to messages sent from Zoho Mail and attach files that are up to 2400% larger than the previous limit. All you have to do is convert them to a link—an option available right inside the mail interface. Apart from the obvious advantages of having your files always available on the cloud, with this integration, you can avoid the confusion of creating and sharing multiple copies of a file through mail. Share files with specific recipients without even moving to another tab. This way, every change made reflects in the same file. User permission settings keep your data secure. You can even set expiration dates for documents that you only want to make available for a limited time—legal agreements, event materials, webinars, etc. Get these benefits and more, packaged in a bundle at prices starting just at $2. Let us know about your experience and give us your feedback at docs-support@zohocorp.com .